Finally. The day we’ve all been hoping and/or waiting for. You can now buy aluminum cranks from Easton. So here’s the deal. EA90 crank arms will run you a cool $120 USD, in comparison to $400 for the EC90 SL arms. You still have to buy a bottom bracket for $50 and choose a chainring setup ($80 for a single ring or $150 for a double). But the bottom line is, you can get into a complete EA90 crank for about half the price of the EC90 SL. Cool. I swapped my 46/30 gravel shifting rings (quick) as well as my power meter spindle (a little more time consuming) onto the new arms and threw a new chain on while I was at it. Since that shifting ring review, my Rock Lobster has seen a major drivetrain update, with early Super Record 11 shifting a 105 5800 front derailleur. This combo has turned out to be the best shifting front derailleur setup I’ve ever experienced… a happy accident? I didn’t really consider weight while I was installing the new arms. Sure, I knew they’d be heavier, but this is a huge steel frame with full-time fenders. I just put the new cranks on and rode. As expected, the forged aluminum EA90 arms are plenty stiff. Construction is similar to Race Face’s excellent Turbine cranks save for some post-forge CNC work on the Turbines. But since we need to talk about what makes these crank arms $120 instead of $400: yes, they are heavier. The aluminum EA90s are 534 grams for the bare arms versus 354 grams for the carbon EC90 SLs. 180 grams. 280 dollars. I like the EC90 SL cranks, but I really like the price of the EA90s. If, like me, you’re into this 46/30 double idea, your options are limited, but hopefully continuing to expand. If you want modern aesthetics you’ve got Easton and FSA to choose from (and Praxis nearly getting there with a 48/32). Since they’ve been making less expensive options a few years, and easier gears simply make sense, FSA and Praxis both enjoy some OEM spec on adventure-type bikes. And since what we now call super-compact is actually an old randonneuring standby, you can get shiny silver – and black – 46/30s and many other weird combos from White Industries, Rene Herse, Sugino, and Velo Orange. 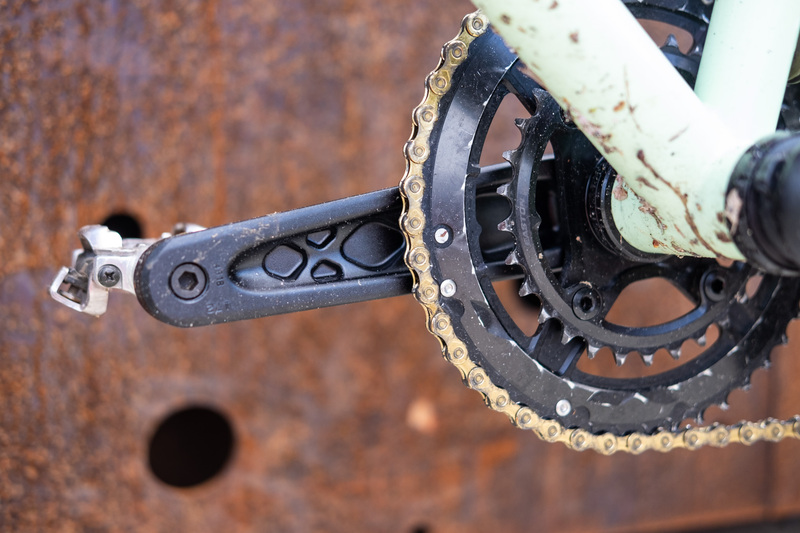 You can also put together your own super-compact setup on the cheap with an old mountain bike crank, but you’ll pay for that with wider Q-factor. So yeah. 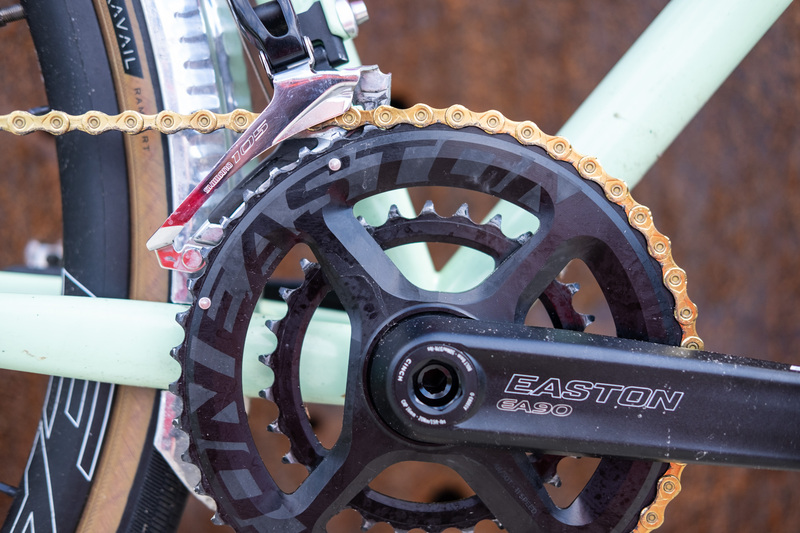 Easton and Race Face’s Cinch system allows you to choose your crank arm length and material, single or double ring configuration, bottom bracket type, spindle width if your nerdery goes that far, and the option to use a power meter spindle. Get as weird as you like, do it cheaper or do it more expensive, and do it because you want these gear ratios and you want modern, high performance stuff on your bike.